Anywhere between 4,200 and 5,000 vertical feet gained depending on who you ask. Susan, the race director, along with her husband, Matt, have been putting on this race for four years now. My understanding is that the first year was an all-pavement affair (for which I’m glad I missed) but the past three years have all been roughly the same involving an out-and-back course starting and ending with 6.5 miles of pavement with 26.5 miles of dirt road and trail running in the middle. 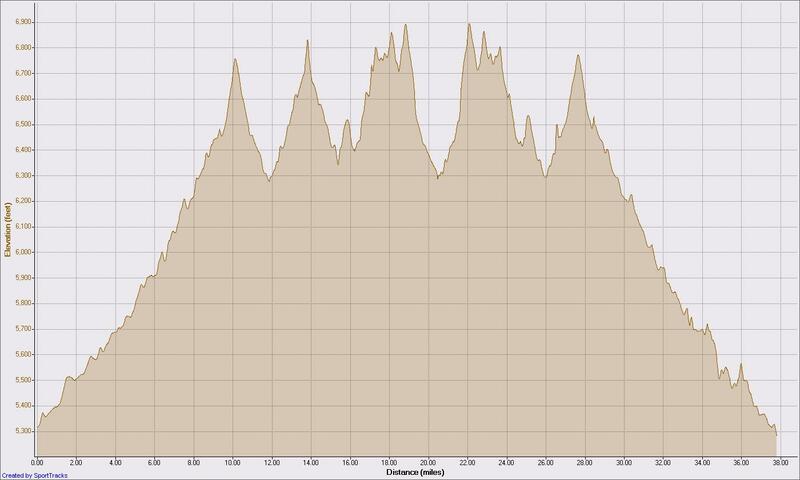 The starting elevation is around 5,300’ with a high elevation of about 7,000’ ( profile from my GPS watch ). Also, for the first three years, this race has been mostly “under the radar” of many ultra runners. 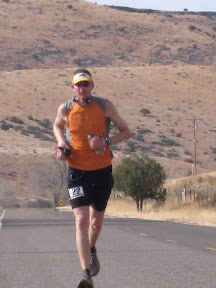 That changed this year when some fast dudes showed up including Andy Jones-Wilkins (AJW). Until now the course record had been 6:06:00 set by Albuquerque runner Ed Heller. I hoped to best that time and go under 6 hours and I knew AJW and a few others would likely do the same and finish in front of me. Looking at the list of entrants before the race, I told a friend “I’ll be super happy to finish under 6 hours and finish in fifth place.” As I would later find out, I nailed that prediction. At 6:00am on Sunday, 72 of us runners all hooted and hollered as we set off from the start line. A relatively warm morning (26 degrees) with no wind and a bright waning moon allowed me to start in shorts, a sleeveless shirt, a light wind jacket and gloves. The pace started out pretty quickly and I went off with the lead pack of six of us—Tim Long, Andy Jones-Wilkins, Bobby Biles, Scott Eppelman, Ed Heller and I. 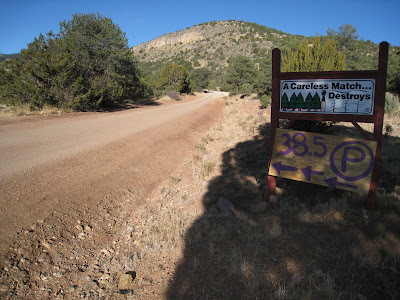 As we topped the first minor hill of the first 6.5 miles of pavement running we were hit with a stiff, cold head wind that lasted until we neared the turn off from the pavement to the dirt road. I was very happy I decided to keep my wind jacket on at the start! The pace was brisk for the first six miles (8:09, 8:25, 7:49, 8:12, 8:12, 8:33) but I knew Ed was a veteran of this race so I figured this was a good, solid pace if he was holding it. But as we chatted he confessed to me that we were going out much faster than he’d ever gone out! Once we hit the dirt I laid back a bit and dropped back to about 30 seconds behind the main group of five ahead as I didn’t want to over do it too early. Honestly, I hadn’t been training too much through the winter opting instead to do more rock climbing and snowboarding and I really didn’t want to make my all-too-frequent mistake of going out too hard. The running surface was now a rolling dirt road that was gradually heading uphill. After about two miles of dirt road we hit a very short out-and-back spur to the station 2 aid station where I refilled my single hand bottle with water and grabbed two more gels from my drop bag. My fueling plan was to eat a single gel packet every 30 minutes and drink water as much as I could. In the end, this worked out great. It made for quick aid station stops and was an adequate fuel amount. After this aid station we all started to break up a little bit with Ed and I taking up the rear of the lead group. The road began a steady grind uphill before cresting out and dropping steeply down some 500 vertical feet in about 1.5 miles. OK, so that’s not super steep but compared to what we had been running, it felt steep. I commented to Ed that the hill would be a joy on the return and he said “yeah, but then it’s 9 miles downhill to the finish.” I looked forward to that. Typical course view and condition. 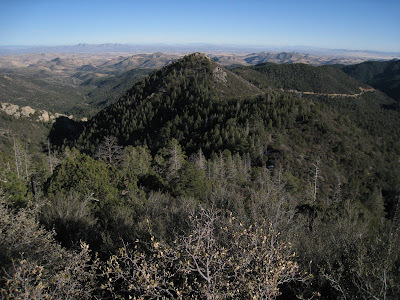 Pretty gorgeous in the Gila National Forest! At mile 12.7 we all turned left onto the 4 mile round-trip out-and-back spur trail. This was a rugged but beautiful section of the course and definitely my favorite part. It was an old road used to access a mine. The “trail” here obviously sees little traffic these days and crosses a small stream many times. Numerous small, clear pools of water lined the trail and for a short bit we ran along the base of a huge limestone wall complete with a large natural limestone arch! I nearly tripped a couple times as I looked up at this wall and arch considering the climbing possibilities! As I ascended the last, super technical section of the out-and-back I saw Tim coming back down followed closely by AJW, Bobby and then Scott. I was in fifth position at this turnaround. On the way back down this spur, I made good time as I tend to move pretty well on technical descents and ended up passing Scott to move into fourth position. It was along this section that I saw many of my friends heading out while I headed back. I gave hoots, hollers and/or high fives to David Coblentz, Bill Geist, Tom Stockton, Dan Hadlich and many others. I love out and backs for the very reason of getting to see friends along the way! Back on the main road we continued heading out to the big turn around. It was rolly with plenty of loose, eroded sections of road to keep my mind in the run. I had been running with my iPod off until this point but with the group broken up and no sight of anyone in front of me or behind me, I turned it on and turned it up for some motivation. For this run I’d be rocking to Silverstein and Strung Out. Not actually on the course but a good view of the Gila National Forest from Emory Pass the day before the race. Lots of space out there. At about mile 18 we began a long, technical descent to the turn around at Cave Creek at mile 20.6. Shortly before the turn around I saw Tim and AJW coming at me again not too far apart. Those two were holding it close and I knew it was going to be an interesting finish for them. And just before I reached the turn around Bobby cruised on by me on his way back in too. I took a bit of time at the Cave Creek aid station (station 4) futzing with my jacket and gloves and decided to leave them both there. I picked up a second water bottle here and filled it up thinking I had already poured some HEED drink powder in the bottle but as I left the aid station I realized I had not done that so I had two bottles of water. I promptly poured out half of one bottle as I wouldn’t need that much water to the next aid station. As I began the grind up the technical climb back out of Cave Creek I again saw all my fellow Los Alamos friends and got a boost from their positive comments. I power-walked some bits of the hill climbs and cruised into station 3/5 again to swap out one of my bottles for a bottle that actually did have HEED in it and grab some more CarbBOOM gels. Leaving station 5 was again a bit of an uphill grind but it was over quickly and I was into more rolling terrain and trying to keep my pace up around 10 minute miles or better and was feeling pretty good. I couldn’t see anyone in front of me but also couldn’t see anyone behind me so I just kept doing what I was doing hoping to hold onto fourth position to the finish. At station 6 I added some more HEED powder to one bottle and filled the other half way with water and got moving again. I didn’t see anyone come in behind me there either. But as I hit the rolling and smooth dirt road out of station 6 and neared the pavement again, I looked back to see a runner coming up fast from behind. I was totally impressed with the speed of this guy! Just before the pavement I stopped to take a leak one last time and the runner coming up from behind passed by me. It was Pete Stevenson looking super strong. Once we hit the pavement I tried to keep up with Pete’s pace but my legs were having none of it. Pete just blasted off into the distance. Pete’s speed gave me some serious motivation and I knew if I could keep pushing hard enough to stay under a pace of 9 minute miles, I could hit my goal time of under 6 hours. I kept pushing and cruised right on past the last aid station, station 7, at mile 34, smiling at the nice and encouraging aid station volunteers. I knew it was going to be close and I didn’t want to stop now. I started to see buildings and knew it wasn’t far. Then I saw the line of cars parked in front of Susan’s house and could hear some clapping and yelling. I ran an 8:30/mile for the final mile to finish in 5:52:15. It felt great to have met my sub-6 hour goal with a race performance that I was very pleased with. The afternoon was spent lounging, drinking four New Belgium 1554 beers, eating the super tasty homemade food and cheering on the rest of the finishers until my friend Minesh finished. This race was his longest ultra to date and he finished in 10:37:ish with a gutsy effort. An excellent post-race BBQ with a few beers around the campfire topped off a great day of racing.